You are going to Watch Naruto Shippuden Episode 107 English dubbed online free episodes with HQ / high quality. Stream Anime Naruto Shippuden Episode 107 Online English dub Strange Bedfellows. Guren tries to attack Naruto within the Three-Tails, but passes out instead. Meanwhile, Sakura and Ino heal Yūkimaru while Kakashi, Shizune, Kiba, Sai, and Hinata search for Naruto. Guren awakens and is shocked that Naruto has helped her recover rather than kill her. 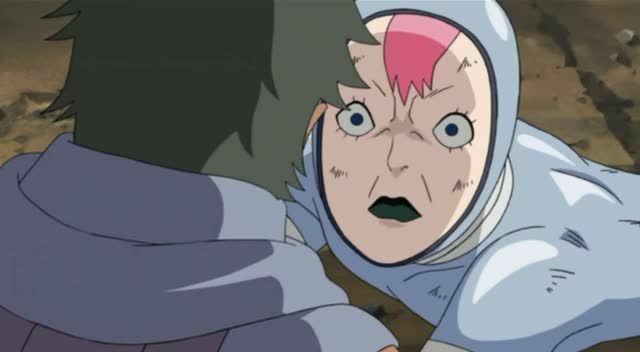 Naruto tells her that he could not bring himself to kill a passed out ninja especially after helping him survive against Three-Tails. Naruto and Guren soon encounter a horde of mini Three-Tails that try to attack them, but they evade them and begin to argue about Yūkimaru. While Yūkimaru awakens, Naruto summons numerous Shadow Clones to look for a way out of the beast’s stomach. Elsewhere, Kabuto gives Curse Marks to Rinji’s men, ordering them to capture Yūkimaru.